My last post was a Stormking III, so I told you a lot about the model line. Some of the Stormking models are super rare. One of them is the military version of the Stormking IV. It's called the Stormking IV Military because it has a 24-hour dial. It was produced from 1956 through 1959. Like the regular Stormking IV, the Military comes in a 10K gold filled case with a stainless steel back. Tucked inside you will find an 18 jewel 735 movement. The 735 is a shock-jeweled upgrade to the 748 movement was discontinued in 1955. 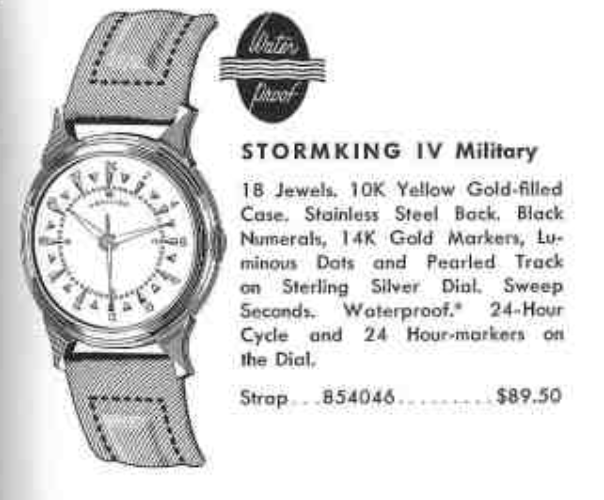 The sterling silver dial of the Stormking IV Military is much more complicated than the 12-hour version because there are 24 solid 14K gold hour markers. It takes 24 hours for the hour hand to make it around the dial so 12 noon looks like 6:00 on a regular dial. That makes glancing at this watch and telling the time a little tricky, until you get used to it. There's a circle of pearled dots inside the hour markers with luminous dots at the 2, 4, 8, 10, 14, 16, 20 and 22 hour positions. The luminous dauphine hands glow in the dark too. This is a very uncommon watch and I was fortunate enough to have a friend send me his. As received, it came on a bracelet that looks like the sort of style that could be original to another model but it's not original to a Stormking IV or the Military version. The crystal was beat up and if you look closely, there's no second hand. The back screws off to reveal the movement, tucked safely inside a movement ring. The dial has some spots but looks to be original. A close look at the second hand bit shows that it's still there - so that's not the reason for the missing second hand. It wasn't inside the watch so it was removed for some unknown reason. The back of the dial is clear of any markings, so that's a good sign that this is an original dial too. Here's a shot of the 24-hour setup on the left compared with a 12-hour setup on the right. The diameter of the 24-hour hour wheel is larger than the regular wheel. It has more teeth, as well. The minute wheel is also different - it has fewer teeth to engage the hour wheel and it's a slightly smaller diameter on the pinion side of the minute wheel. If I zoom in a little closer, you can see the differences between the two hour and minute wheel combinations. Just those two parts are what make this Military version unique. Everything gets cleaned and readied for reassembly. It's running really well right out of the shoot. I'll slow it down a little more but I tend to leave watches running just a little fast as I think they slow slightly over time. A new crystal and a fine lizard strap make a dramatic improvement to the watch's appearance. Fresh lume on the hands and dial doesn't hurt either. I don't know what exact second hand the watch should have - not that I would have it anyway. I did happen to have a spare Rodney second hand though so I installed that instead. The Stormking IV Military is a very cool watch and a great conversation piece. I like it... too bad I have to give it back.